Melanie has always loved the powerful, moving sound of the taiko and the way it makes her feel. She wanted to learn the art for years, but was unable to find a group that taught classes. After seeing a taiko performance at her son’s school, she began her search again. Melanie took her first Naruwan community class in August 2016 and was hooked. 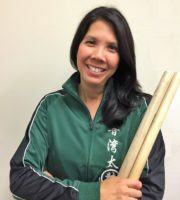 She feels very fortunate to have found Naruwan Taiko and is grateful for opportunity to learn from, and perform with, such an amazingly talented, energetic, fun group of people.